The weather this weekend has been far too nice for sitting in front of a computer writing. Instead I’ve been watering the garden, paddling in the sea and drinking Aperol Spritz whilst people-watching on the sea front. Weekends like this are precious commodities, not to be wasted indoors. Cleaning, tidying, answering e-mails and paying bills can wait for a rainy day. 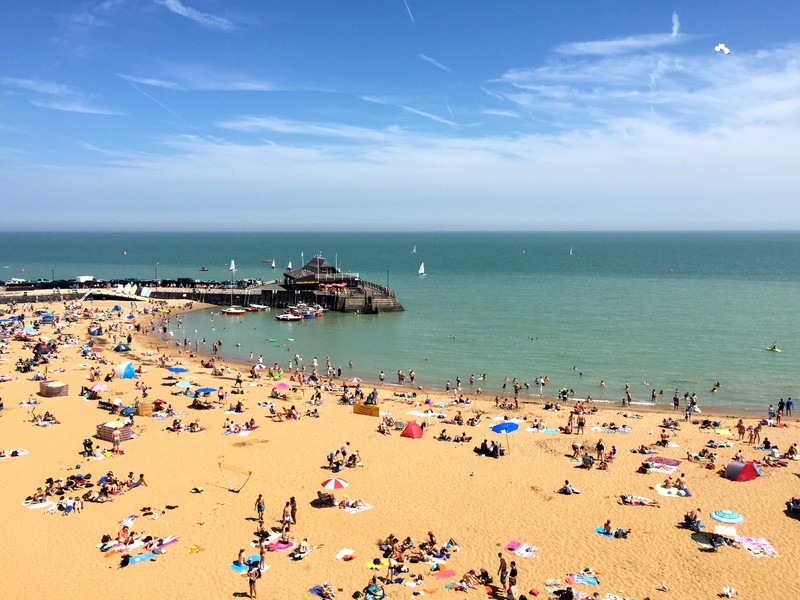 Here’s the scene today in Broadstairs harbour, the sea as calm as a mill-pond, the sky sullied only by the tiniest wisps of white cloud. Absolute bliss …. and it’s not quite over yet. As a result, my Hampton Court Flower Show reporting has temporarily stalled. However, I am prompted to share with you two gardens which I might not have bothered with otherwise, staged by the people of Southend-on-Sea, a town on the northern side of the Thames Estuary. The first, entitled ‘By the Sea’, is a classic seaside pastiche, designed by a local Scout leader and built by young offenders. A gravel path meanders through planting which has been arranged to reflect the sea’s waves. It leads to a decked area, inspired by the local pier, which incorporates a section of the railway track which once ran to the end. Plants are chosen to cope with an exposed coastal location: Eucalyptus gunnii adds height and Buddleja davidii helps to balance the space and add fragrance. 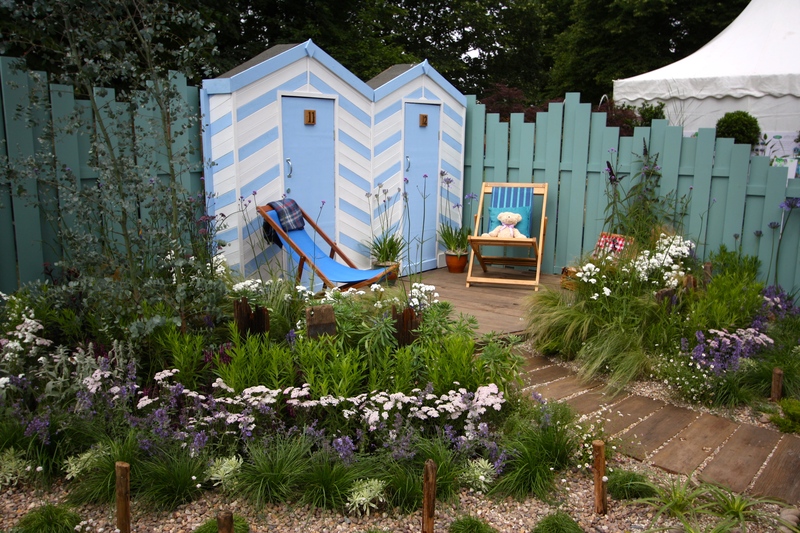 The pale blue and white beach huts are too cheesy for my taste, but this would make a fun colour scheme for a shed or children’s den. The colour of the fence is altogether classier and almost identical to the colour of sea here in Broadstairs today. A second garden, ‘Fun on Sea’ (above), is remarkable simply because it was created without any budget. The garden was designed by Tony Wagstaff, built by young offenders, and filled with plants grown by Southend-on-Sea Borough Council. 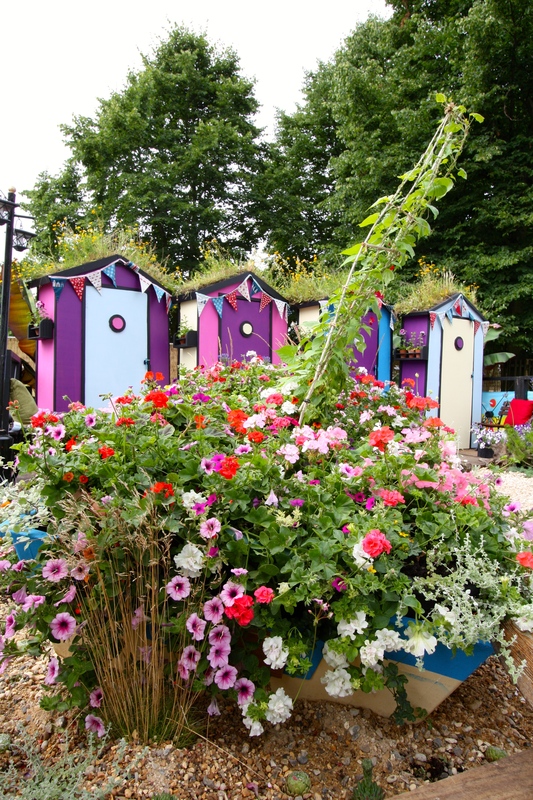 The brightly coloured beach huts were constructed using sections of hoarding that recently surrounded a building site. 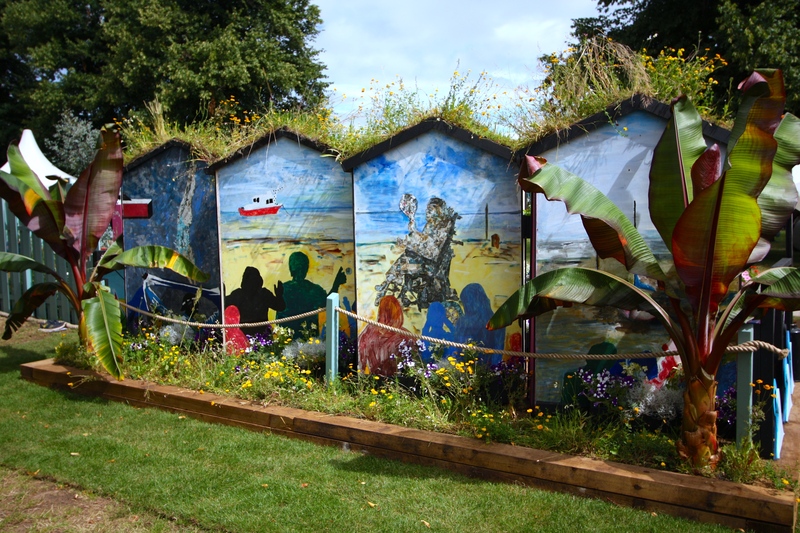 A peak around the back of the garden revealed murals painted by local people to reflect life in the town. 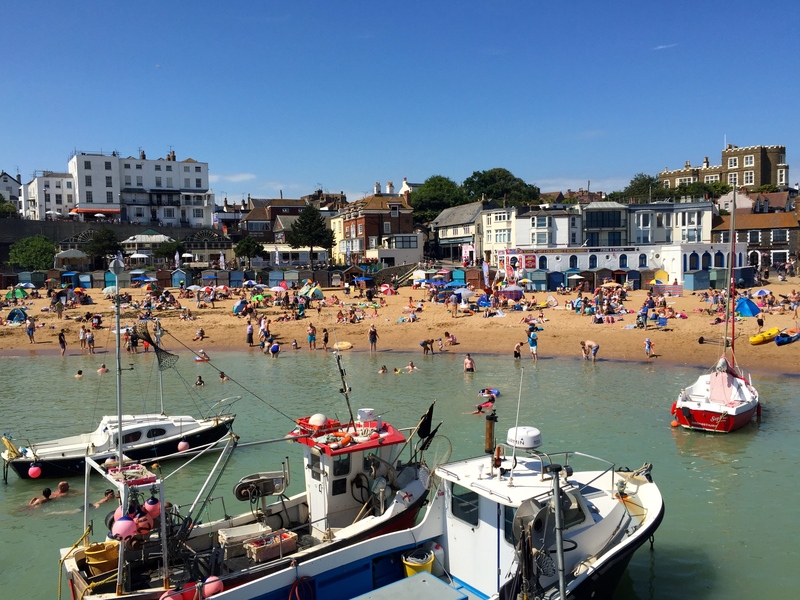 Like Broadstairs, Margate and Ramsgate, Southend is currently enjoying a resurgence of interest from day-trippers and holiday-makers following investment in regeneration. This garden was conceived to recall the town’s 1950s heyday when bucket and spade holidays and amusement arcades were de rigueur. A small boat, complete with sail festooned with morning glory, was brimming with an exuberant mixture of petunias and geraniums. Following the show, the garden will be relocated to the town to promote tourism. Whilst neither garden could be described as sophisticated, they represent the very essence of the seaside and a design style which will resonate with many who live, or aspire to live, by the coast. Those of us who choose to live by the sea do so because it brings us joy, or an escape: these gardens offered both possibilities in buckets and spades. TFG. Makes me almost homesick (I grew up by the sea), looking at your photos. Love the beach huts! There are some beautifully painted beach huts in Broadstairs. The council-owned ones are all light blue and yellow, but private owners can do as they please. I think there might still be some in places like Scarborough but I haven’t noticed any as striking as these before! 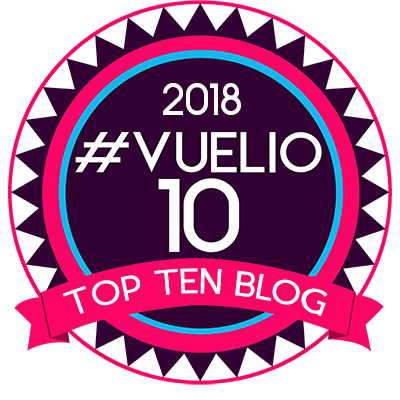 You have evoked happy memories with this post. Great photos of fun little beach/garden vignettes and yes to whimsical for me too! Still happy memories! During my time living in England we used to spend time on the coast off Hemsby on the Norfolk and I loved the beach huts! So so quintessential English at the beach! I grew up a California beach girl in San Diego. Houston has beaches but the water is icky brown and warm! You’re not selling it Laurin! Mind you, on a rough day our water is icky brown and ice cold. Not sure that’s any better. I spent all yesterday afternoon at my friend’s beach hut in Whitstable. Absolute bliss. 😊 I prefer a walk on the beach in a wool jumper personally! So fabulous!! I am missing that beautiful vista and so pleased you enjoyed such gorgeous weather. 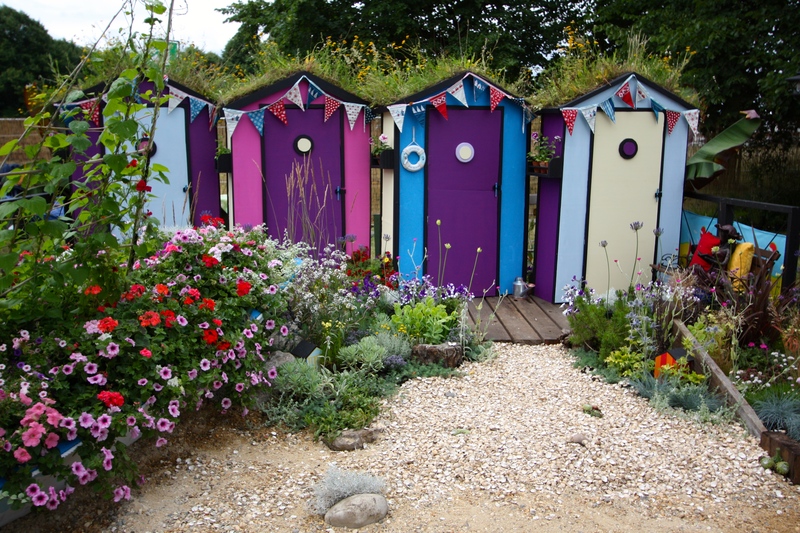 How fun and ‘happy’ are those HC seaside gardens ,so so British and complete with bunting! Not for me personally but I love the ‘sharing of joy’ that only a garden of this style can bring. Thanks TFG, a very uplifting post for a Monday Morning. I will now bounce out the door with coat and gloves and off to the airport in 7 degrees….